Cut the pumpkin / kashiphal into small squares. Heat oil and put fenugreek seeds and cumin seeds. As the seeds turn brown add turmeric and red chillies to your taste. Put in the Kashiphal /Pumpkin. Fry ,cover and cook till tender and leaves oil. Meanwhile soak tamarind in a small amount of water, remove the seeds , pour this thick paste into the pumpkin/kaddu and put half cup of water, simmer. As it simmers put jaggery into it and boil till it melts. 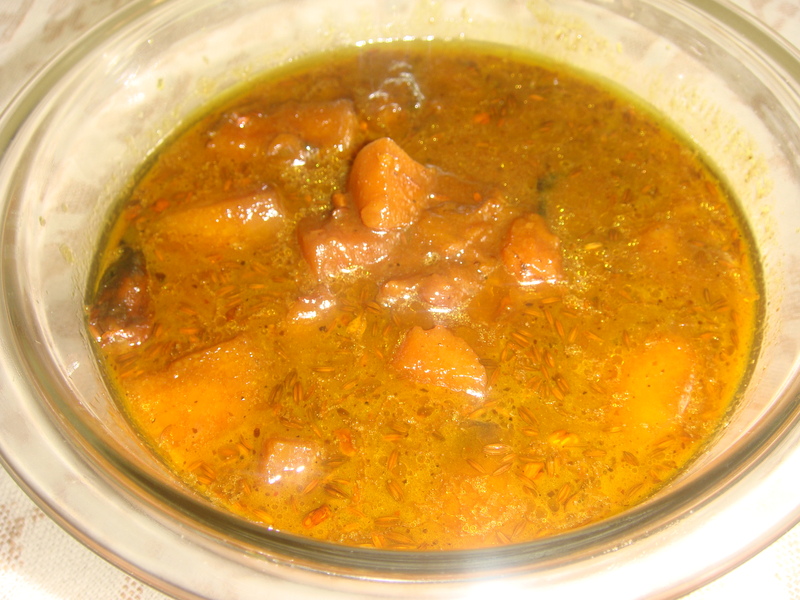 Tasty ambal which is a dogree dish of jammu is ready to be served. It goes well with rajma and helps digest it.